Lumberwhack recieved a great review from Noobsource yesterday. Thank you Noobsource! Koloss Interactive is treading some new ground on the pricing front. The side-scrolling/ tower defense market has been dominated by free-to-play apps and in-app purchases to capitalize on the difficulty curves in-game. Lumberwhack costs $0.99 and is worth every penny. It’s a great feeling to be able to play a game and not have difficulty ‘pay-walls’ put up to force you to pay up to progress. Here, you pay at the door and can enjoy the game. This is tower-defense gaming evolved: incorporating features of other titles in the genre and refining them into something addictively pure. Whether you enjoy the graphics, collecting all the animals, or competing for best score on Survival mode, there’s something for the casual and veterans of the genre here. 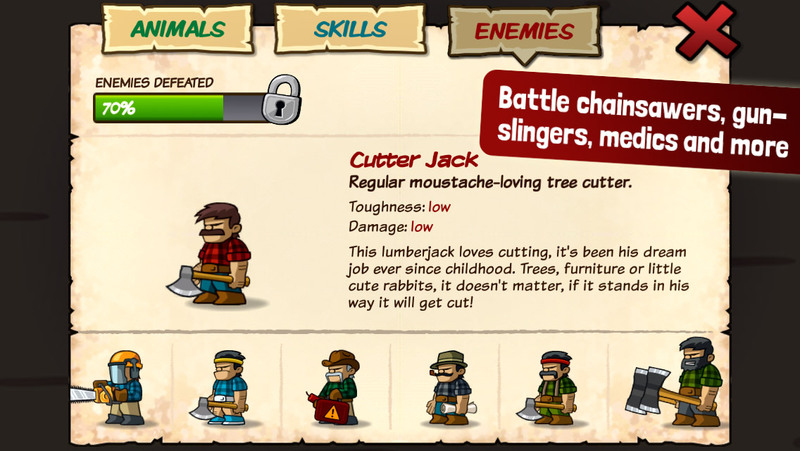 A new Press Release is out for my upcoming defense game Lumberwhack: Defend the Wild. Lumberwhack will be available for sale the 7th August at the iTunes Store. It will have a limited release discount price of $0.99! “Koloss Interactive, an one-man indie game studio, is releasing it’s first title Lumberwhack: Defend the Wild for iPhone, iPad, iPod Touch next week”….